Our offered Refrigerated Truck Strip Curtain are insulated curtain walls and strip doors that are designed specifically for use in refrigerated trucks. These offer a perfect solution for trucks that unload material in varying temperature zones that do not want to constantly open and shut the doors of the truck. Moreover, the thermal barrier keeps products safe and ensures that workflow remains steady. 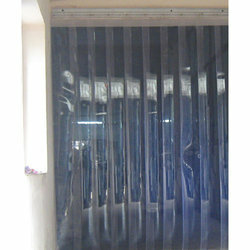 Looking for Refrigerated Truck Strip Curtain ?